OK, the Rangers don't like the Blue Jays and vice versa. Cole Hamels will get the start in Game 1 of the ALDS and addressed the rivalry. "I know this team. I don't think there's any other focus than going out and trying to win a ballgame and trying to advance," Hamels said. 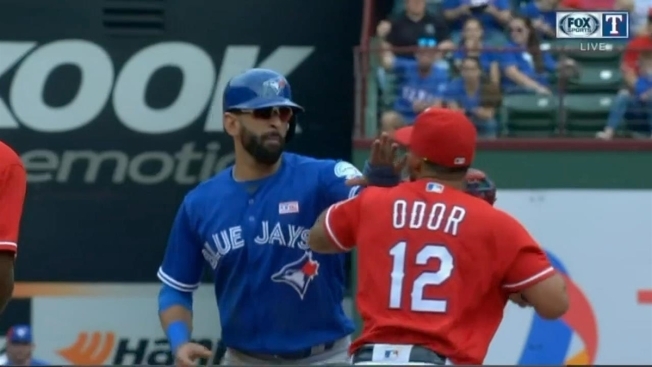 The fans in Toronto held negative signs that were about Rougned Odor during their Wild Card game against the Orioles Tuesday. That tells you how much they hate the Rangers second baseman for socking Blue Jays outfielder Jose Bautista earlier this year in Texas. Hamels is a former World Series MVP and offered this calm approach to the excitement that is building for Game one in Arlington. "I don't want to speak for the Blue Jays, but I think their main goal, too, is to win a World Series." Rangers third baseman Adrian Beltre echoed the same thing in the clubhouse on Wednesday.